Ursus horribilis californicus, is long extinct. Earlier this month, California’s beleaguered salmon fishing industry finally got a break. After the catastrophic collapse of Central Valley’s fall Chinook run in 2008-2009, hundreds of thousands of fish may be on their way back to Sacramento riverbeds. With a forecast of 820,000 Chinook now at sea, commercial salmon boats, rendered irrelevant for two straight seasons and set loose for just eight days in 2010, can return to business as usual this summer. And though the apparent rebound is good news for salmon, the fall Chinook’s future is far from secure. The disheartening run of 2008 followed a lean spawning year (which biologists call “escapement,” after the number of fish that elude fishermen to reproduce), with just under 88,000 survivors returning to streams or hatcheries in 2007. California has four seasonal salmon runs, each with distinct behavioral and genetic traits. Conservation biologists like to compare genetic diversity to a diversified stock portfolio. More diversity means a better chance of weathering tough times. (See, for example, “Irish potato famine.”) And while the National Marine Fisheries Service cited poor ocean conditions as the “proximate cause” for the dismal runs (because freshwater habitat, though degraded, was no worse than usual), the agency also noted several other factors, including heavy reliance on hatchery fish, which homogenized the fall Chinook’s historically diverse genetic portfolio. 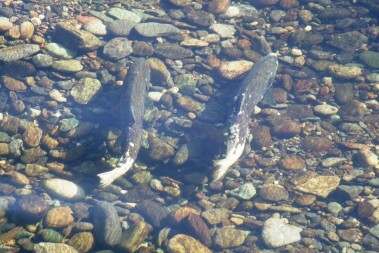 Spring run Chinook are long gone from the San Joaquin watershed. Just 3,802 fish made the Sacramento run in 2009. Pacific fisheries managers monitor Chinook take to allow 122,000-180,000 fish to escape capture and swim upriver. In 2008, just 66,000 fish made it back. Fewer than 40,000 returned in 2009 (close to 54,000 counting hatchery fish), the worst run on record. This season’s good news notwithstanding, the grim returns of the past few years didn’t affect just fishermen and salmon consumers. Biologists have long known that ecosystems suffer when managers value economics over ecosystems and allow overfishing. But cutting back on harvests to let more salmon spawn in rivers and creeks will not only help safeguard their ecological role, argues a study published last week in PLoS Biology, but will help commercial fishers and consumers by ensuring a future for salmon. and eventually the offshore salmon catch. Salmon are the ultimate mobile nutrient-delivery system. They spread the wealth wherever they go, from streams to sea and back again. Healthy salmon runs boost primary productivity in coastal lakes (by providing nutrients for algae), fuel vegetative growth along streams, creating better habitat for salmon hatchlings and leading to higher densities of diverse insects and songbirds. They also feed all manner of predators and scavengers, from orcas to raptors and—in the places they still exist—grizzly bears. Hundreds of thousands of salmon once injected massive seasonal pulses of nutrients from the sea to Pacific coastal and riparian ecosystems. Commercial harvests deprive ecosystems of this historic recharge. But restricting harvests cuts into fishery profits. Levi and his colleagues developed a model to help fishery managers weigh the costs and benefits to commercial fishers and ecosystems of allowing more spawning, using grizzly bears as a proxy for salmon’s ecosystem benefits. 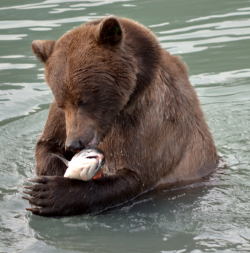 Studies show that spawning and dead salmon are the single most important fall resource to grizzlies preparing for hibernation and cub-rearing on Alaska’s Kenai Peninsula. 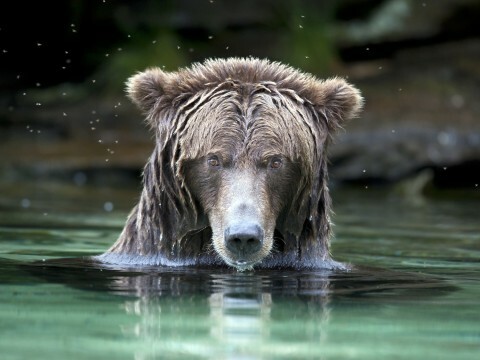 In this study, the authors show that grizzlies are good indicators of salmon’s ecosystem services because bear densities are so closely tied to salmon abundance. The authors used fishing records to model increased escapement across various management options for six sockeye salmon stocks in Alaska and British Columbia to determine how bear numbers and income from fishing change with the number of fish harvested. For each stock, more spawning meant more bears. And for sockeye stocks that breed in streams alongside other salmon species, both long-term fishing yields and bears benefited from higher escapement. Conservation and economic interests conflicted only where grizzlies are threatened and eat primarily sockeye, because reducing harvests would cut into profits. But the tradeoffs would be clear, and managers could estimate the costs of protecting salmon runs and endangered bears. It’s conceivable that managers could even find ways to help fisheries recoup their losses in the name of conservation. The fishing industry in California doesn’t dominate the state economy as it does in Alaska. But Levi argues that having more salmon in streams would also have economic benefits from better wildlife viewing opportunities. Increased salmon abundance would surely help California’s bald eagles. “We don’t have abundant bald eagle populations anymore but we have a nesting pair at Pinto Lake in Watsonville,” Levi says. (There’s another pair in San Mateo now.) More salmon would be a boon to the state’s recovering eagle population. More salmon would also increase black bear populations, he says, which is good for both hunters and wildlife observers. Black bears often move in when grizzlies go extinct, serving a similar ecological role. In fact, biologists say, black bears eat more salmon than grizzlies because they’re more widely distributed. 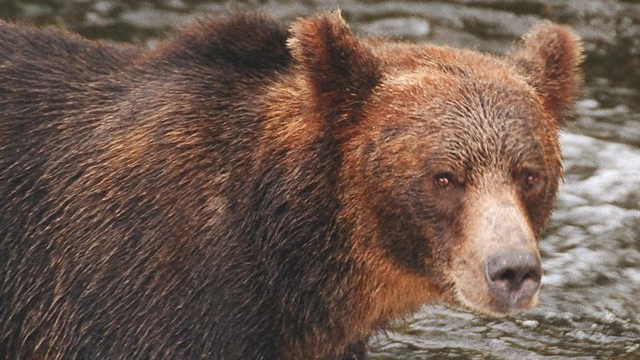 But there’s no reason that restoring California’s salmon runs couldn’t go hand in hand with restoring the state’s grizzly population, Levi says: California and Oregon have millions of acres of contiguous protected land, more than enough to support grizzlies. In the 1970s, grizzlies survived on only 4 million acres in the Greater Yellowstone Ecosystem, he points out. Protected areas in six national forests from Klamath to Mendocino provide nearly 9 million acres of contiguous habitat, not counting available habitat along the coast range from Humboldt down to Point Reyes. Excellent article about California salmon runs by the best science writer on the planet who also happens to be my sister. California’s official state flag features a grizzly bear. The flag was formally adopted by the Legislature in 1911. The bears were gone by 1922. Liza Gross, an award-winning independent journalist and senior editor at the biomedical journal PLOS Biology, writes mostly about conservation and public and environmental health. She was a 2013 recipient of the NYU Reporting Award, a 2013 Dennis Hunt Health Journalism fellow and a 2015 USC Data Journalism fellow. Read her previous contributions to QUEST, a project dedicated to exploring the Science of Sustainability.